This lightweight, 4-string, SX Country 4 30G NA Banjo is a beautiful instrument that can be used for jazz or Irish music. They’re also used in some reggae and Moroccan songs. 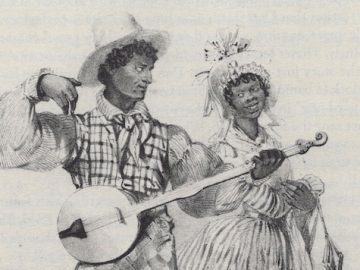 The banjos with 4 strings are tuned in intervals of fifths, and they’re in the same family as other instruments tuned in fifths like violins and violas. 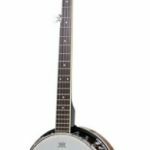 The standard tuning for the 4-string tenor is C, G, D, A and the Irish tenor tuning is G, D, A, E.
This lightweight tenor banjo is tuned to C, G, D, A, and has a slim neck for easy playing on the frets. This makes it a great banjo for anyone with smaller hands. Some banjos have 17 frets, but this one has 19 frets and star-shaped pearl inlays. The back of the banjo features a curly, arched Malapoka. It’s done in a natural finish, too. With this tenor banjo, you’ll be able to play jazz by yourself or with a band. It’s also a terrific banjo for Irish music. The width of the neck near the nut is 1 and 3/16th of an inch. This is a very thin neck width for those who are not used to playing a wide instrument. It weighs less than 7 pounds, and it comes with a gig bag for when you want to take your music on the road. Every single banjo needs to be setup out of the box. If this is your first time ordering a banjo, you might be a bit disappointed to receive the banjo and see and hear that it needs work. You can tune this with the help of a tuner on your smartphone, or you can bring it to a professional music shop where the owner or employee would be happy to help. It doesn’t cost much to have it professionally tuned. The bridge will have to be placed on the banjo, and the neck or head might need tightening. This beautiful banjo is made of rich, quality wood. The mahogany neck and pot, the rosewood fretboard, and the malapoka back all are quality materials that you’d expect to find on a well-constructed instrument. The tuners, brackets and armrest are all made from a shiny chrome. Each banjo head helps create the banjo sound depending on the material used. Some are a material that is much like synthetic materials used when banjos were first used. They had sheep or calf skin stretched across the head. The Remo brand is a trusted one that is used in many quality banjos. It’s a frosted Mylar that is stretched across the head and brings a bright tone to the instrument. It’s the small details that make this a great instrument. The beautiful wood, pearlized inlays on the fretboard, chrome details, and Remo head combine to give you a beautiful instrument with a great sound. The tone of the banjo will change depending on whether the banjo is a resonator or an open back. A resonator will project the sound forward towards the listening, which gives it a twang that isn’t experienced with an open-back banjo. Open back or resonator is often a personal choice for the player. This is a resonator model that can be adapted to open back easily if you wish. Is this a good beginner banjo? It definitely is a good banjo for the beginner who has never played before. It’ll grow with the player as they learn, too. How much does the banjo weigh exactly, and can I take it on a walk to a campsite? It’s the perfect instrument to take with you into the woods if you’re going camping. You can sit near the fire playing the banjo for your friends. It weighs 6.5 pounds, and includes a padded bag. Should I purchase new strings? Some people are not happy with the original, factory strings on most banjos. To be safe, you should purchase new strings, so you’ll have them ready. This SX Country 4 30G NA Banjo with Bag is a tenor banjo with 4 strings that is tuned for Jazz, but you can certainly have it tuned to whatever you like including a tone that’s great for Irish music. 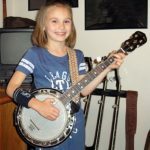 If you’re new to the banjo, don’t be afraid to bring it to a music shop to get some tips on how to setup the instrument. Every instrument needs tightening and tuning out of the box. This is a slim, lightweight banjo that is great for a beginner to the instrument.